Old fashioned bombast is back, back, back thanks to Alan Silvestri's gloriously old fashioned score for Captain America: The First Avenger. The latest superhero blockbuster from the Marvel stable, Captain America stars Chris Evans as scrawny Steve Rogers, who volunteers for a top secret Army programme looking to create a new breed of super soldier. Lo, Rogers is transformed into the titular hero, and sets out to defend American ideals from his foe, Johann Schmidt aka Red Skull (Hugo Weaving). Support comes from the likes of Stanley Tucci, Tommy Lee Jones and Hayley Atwell. The film's nostalgic outlook and clear-cut portrayal of good vs. evil have earmarked it as something of a throwback product, hearkening back to a more innocent period in blockbuster cinema. Listening to Alan Silvestri's score confirms the suspicion. The score's emphasis on themes, full orchestra and rampant action distinguish it from recent superhero efforts, which have tended to favour ambience, texture and volume above memorability. But then Silvestri has always maintained his own musical voice, and that Joe Johnston has allowed him to unleash it is thrilling. Given the expectations that come with the Marvel brand name, it's brilliant to hear an action score that's not merely emulating the Hans Zimmer Remote Control sound. This is a score which owes more to Silvestri's own classics Back to the Future and Predator than to the likes of Inception. Key to the Captain America score is its sense of structure. This is not a score which frontloads the album release with blasts of the main theme (brilliant as it is) - a refreshing change of pace for a composer with a particular knack for emphasising the central theme within his scores. 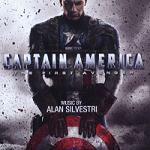 Instead, Silvestri uses the theme sparingly throughout the score's first half, as Evans' Steve Rogers has not yet embraced the heroic destiny that will see him transform into the famed First Avenger. "Main Titles" teases us with a brief, sparse rendition of the theme on minor brass and snare drums, before darker material representing the baddies takes centre stage in "Frozen Wasteland" and "Schmidt's Treasure" – all shifting strings and moody brass tones in the style of What Lies Beneath. "Farewell to Bucky" is one of several tender tracks which break up the onslaught and make the score more enjoyable than it otherwise might have been; at the end there's another teasing rendition of the theme. A classic timpani led Silvestri moment arrives in "Training the Supersoldier" before "Vitarays" builds the first moment of sustained thrilling action in the score, the composer's familiar mickey-mouse action style coming to the fore. 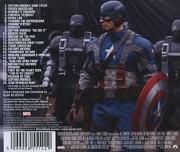 It's ideal preparation for the first proper blast of the main theme in "Captain America 'We Did It'". Silvestri's magnificent, anthemic, brassy theme invites a host of adjectives: patriotic, noble, grand et al. This is what a superhero score should sound like! From there Silvestri lets rip with a welter of thunderous action music in tracks such as "Kruger Chase", "General's Resign", "Troop Liberation" and "Factory Inferno". The sense of movement between different parts of the orchestra is an undeniable hallmark of the composer but he refuses to fully let rip with the main theme again until the wonderful, 2 minute rendition in "Triumphant Return", which is as terrific as the title suggests. The climactic portion of the score then weaves in brief bursts of the Captain America theme in counterpoint to the blustery action music, signifying how the eponymous hero has come to embrace his status as defender of all things America. "Hydra Train", "Motorcycle Mayhem", "Invasion" and the climactic "Fight on the Flight Deck" build a palpable sense of momentum. But really, the best is saved until last: "This is My Choice" and "Passage of Time" build the theme to awesomely romantic and memorable proportions, with a particular emphasis on strings as well as brass, before the final standalone rendition of the theme comes in "Captain America", bringing Silvestri's contribution to a satisfying close. There then follows a piece of source music composed by another Alan – Alan Menken this time, best known for his acclaimed contributions to Disney. "The Star Spangled Man" is an enjoyably tongue in cheek piece of nostalgia, sung with gusto by the Star Spangled Singers and blessed with typically sharp lyrics from David Zippel. It complements Silvestri's music very effectively. This review is already overloaded with superlatives but Alan Silvestri's wonderfully old-fashioned score is a blast of fresh air. It's so pleasing to hear an action score so robust, so intelligently structured, so purposeful and successful in conveying the film's emotional needs. And to have a memorable theme too – that just caps it off. Captain America: The First Avenger is Silvestri's most enjoyable action score in several years, and shows he's one of the old-guard when it comes to conjuring up a fully orchestral ruckus. 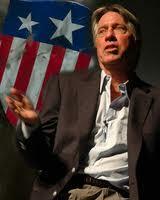 Alan Silvestri's score is available at these links Amazon.co.uk and Amazon.com. At the time of writing if you purchase the album from iTunes you can claim an exclusive track named "Captain America March" which is absolutely terrific, and absolutely in spirit with 1930s heroic jingoism.